It’s probably fair to say that my gaming tastes have changed rather dramatically over the years. After originally starting out my days sliding through the corners of Bandai Namco’s Ridge Racer Revolution, trying to save the Mudokon Slaves of Oddworld: Abe’s Oddysee and attempting to navigate the corners of the haunting Spencer Mansion within Resident Evil, there hasn’t really been many game genres I haven’t been keen to jump into. My early Xbox days also saw my interest expand into the rhythmic musical addiction known as Guitar Hero. Unfortunately, recent years haven’t been great to the once iconic series, but that doesn’t mean we’ve seen the last of rhythm based music games. 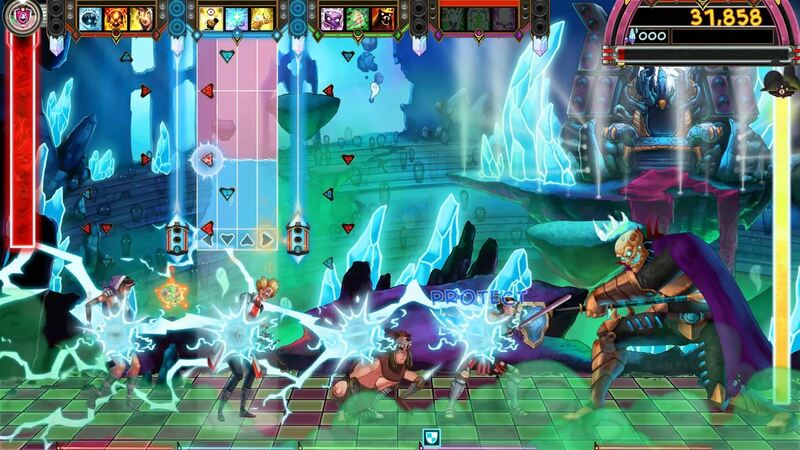 Here, with an RPG twist, is the latest attempt to revitalise the genre with The Metronomicon: Slay the Dance Floor – but is it any good? I’ll be honest – before this game arrived on my Xbox, it’s fair to say I had absolutely no idea what it was about. I hadn’t seen it advertised, I hadn’t heard of it and to make matters worse, things only got more confusing after watching the trailer. But after revisiting the tutorial level a few times, and watching the rather motivating opening video to help kickstart the story, I was ready to rid the mythical land of Versa of all magical attacks and monster raves, trying to bring peace to the people of the land once more. How? With my group of magical, musical graduates of course. So, things begin right as your group of wacky dance masters have completed graduation from the school of dancing arts. But immediately problems arise. The land is being attacked and as fresh new graduates, The Grandmaster tasks you and your party to track down the various invading monsters and take them down, utilising everything you’ve learnt within “Rhythmic Combat Arts”. Whilst that may sound like quite a handful, in reality things aren’t all that difficult. 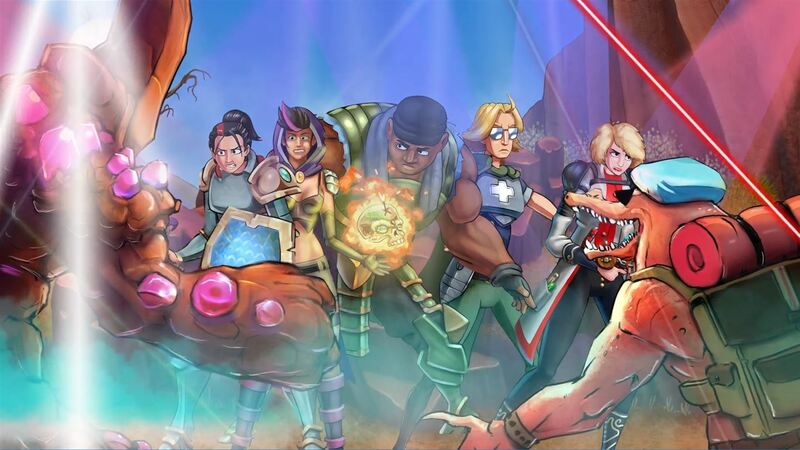 You see, The Metronomicon is very much just another quirky title looking to infuse a blend of RPG style mechanics into its gameplay. Those amongst you who like to keep a close eye on the vast number of indie titles that arrive on the store will remember something slightly similar with Letter Quest, a game which infused RPG mechanics through spelling to attack enemies… and in that respect The Metronomicon is very similar, but just with its own added twist on things. 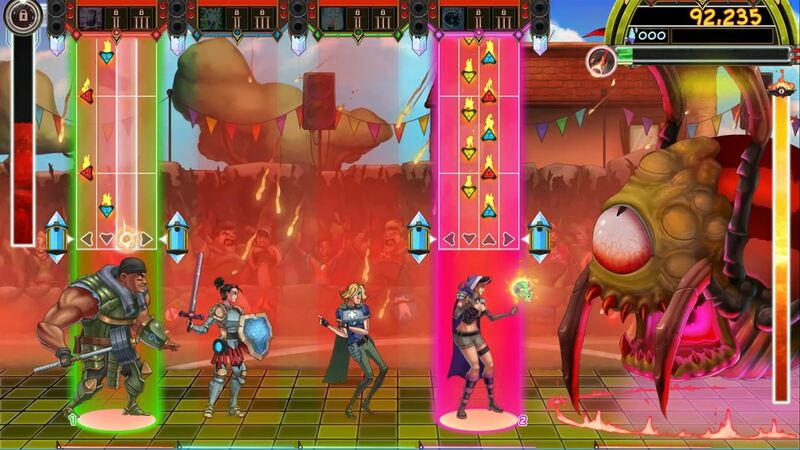 In The Metronomicon gameplay comes via four lanes of scrolling directional ‘notes’ for players to hit. This is done by using either the D-Pad or the face buttons. Each of the four characters have a lane each, with notes scrolling down, and each can utilise different abilities during battle depending on how many consecutive notes have been hit. Our heroes have different spells/abilities available to them, with various elements tied to each one. Elements affect how much damage can be done to each of the enemies within a battle, with most battles involving multiple opponents. The elements are rather simple to follow with Lightning proving lethal when used against water and water putting up a strong battle against fire. With elements and abilities playing such a pivotal role within combat and game progression, it’s well worth spending the time to configure your party of characters, and the abilities they will be using, especially when more get unlocked along the way. This makes it easier to remember just how many notes you need to hit to unlock the second and third abilities in each character’s move-set, which are unlocked by hitting consecutive notes with each. Not all characters have the option to attack, so combat within the game is very much about strategy; a mixture of healing and taunting go a long way toward helping achieve victory. Whilst it may sound like a great idea, continuously striking the notes of an attacking character isn’t the way you’ll be winning the fight, as after each move, characters have a small cooldown period to endure before casting their next spell. This means you’ll need to move between the character lanes – which is done rather simply and swiftly with LB and RB – as you make the most of all available skills. After each song ends, the team receives goodies with experience, currency, and usually an equip-able item given out for good performance. None of it really shouts out as overly exciting though, as they are basically the typical things you’d expect to see from any RPG adventure. 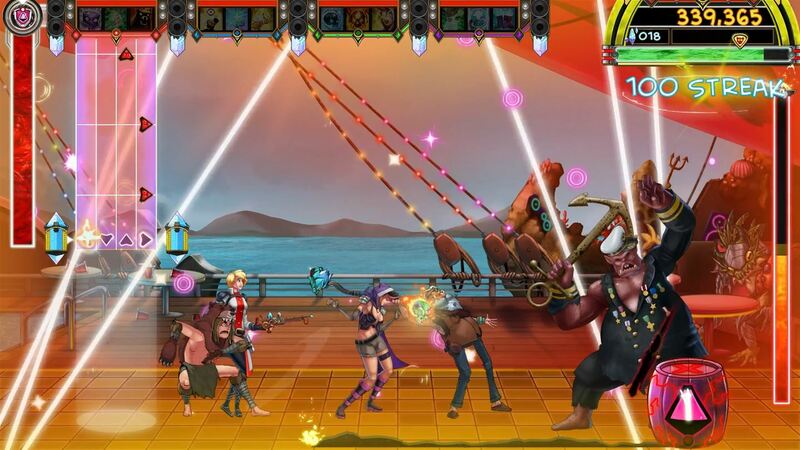 But with The Metronomicon being very much a rhythm music game, the RPG elements make for a nice touch if nothing more. There are five areas to conquer within the story of the game, and this is the place you’ll probably be spending most of your time – although there are some other modes available that should keep those looking for replay value entertained. Throughout the tale players can earn credits, which can be used to upgrade and repair the university, as well as earning unlockables such as team-based attacks and a lab to create better gear for the characters. Outside the story mode come the Arena, Freeplay and Endless Modes, as well as local multiplayer options, allowing you to take in the story with a friend, and Freeplay co-op. Arena offers up unique challenges for players to overcome for potential gear and credits, Freeplay brings a replay of any song already unlocked throughout story progression and Endless Mode offers up a brutal never-ending experience that should only be attempted by experienced players. Of course, co-op isn’t exactly an extra mode of sorts, but it is a different way to play the game, and is great fun provided both you and your co-op buddy have at least a small amount of skill – it certainly makes boss fights a lot easier. As for the music found within The Metronomicon: Slay the Dance Floor, many of you will be glad to hear there is at least variation to the tracks you’ll be playing through. Whilst I didn’t recognise any of the electronic music on show, the chiptune music of Kubbi and the light rock of Shiny Toy Guns made for easy listening. Unfortunately, not all the songs were so memorable but there is certainly enough on show to keep things varied, with funky arpeggios of movement through some of the game’s slower songs, as well as frantic back-to-back chords for others to master. The changing pace of the tracks is nice too and helps to keep a fresh experience throughout, especially when moving up to the harder difficulties. During my time with the game I was also given the opportunity to try two of the available DLC packs, with the Chiptune Challenge Pack 1 and the Indie Game Challenge Pack 1. Each pack contains three songs, but unfortunately with DLC songs not a part of the story, these don’t allow for character progression. Nevertheless, the included tracks certainly provide some catchy tunes and are a great addition for those looking for some extra bits of playability. I can’t claim to feel the levels of excitement I once felt at achieving the 1000 note streaks on the crazy Guitar Hero series, but The Metronomicon: Slay the Dance Floor is a decent enough addition to the genre. With enough RPG elements to help give players something else to focus on, and a vast selection of tracks included, this is one game that rhythm fans should possibly be getting involved in – it isn’t quite the most enjoyable game in the genre, but it certainly holds its own. Although it would have been nice to have seen some well-known songs make an appearance, the song choice contains some catchy tunes, plus the entire game can be played with Rock Band instruments… which is perfect for those who can’t be without a guitar.